This week our Climbing Gym hosted an Add-On Climbing Competition! Climbers of all levels hit the walls and the winner took home a pair of 5.10 Blackwing climbing shoes, complements of Eastern Mountain Sports: NYC – Upper West Side. You can check out our rock walls any day of the week! Come and enjoy the Annual MPHC Waterworks Holiday Show. The show is Saturday, December 13th, 2014 starting at 4:30pm until 6:00pm. There will be a DJ, refreshments and raffle prizes! This show is free for members and a $5.00 admission fee for non-members. ABC News, Bill Evans visits and takes a dive! 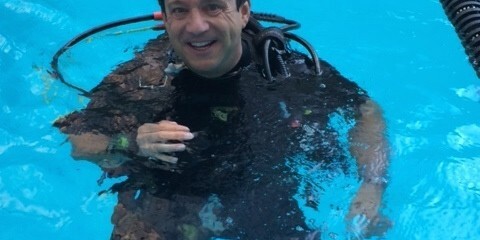 Meteorologist Bill Evans of ABC News dove into the deep end of the pool this afternoon, filming a promo for Beneath the Sea, America’s largest scuba diving trade show. Here are a couple pics from his visit. Neanderthal Ball of 2014 Pics! "Great gym! Has the most professional and courteous staff in the area. "